It’s that time of year again: Dragon Con!!! I know I’ve been absent from the blogging scene for quite a while and I apologize. Real life and all that jazz. But now it’s August, and you know what that means for me…Dragon Con!!! 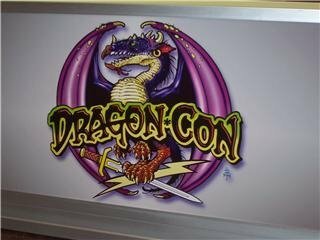 For those of you who are unaware of what I’m referring to, Dragon Con is the largest multi-media, popular culture convention focusing on science fiction and fantasy, gaming, comics, literature, art, music, and film. Every Labor Day weekend, about 40,000 people (or more) crowd the streets and take over the hotels of downtown Atlanta to meet friends, celebrities, cosplay and totally geek out. Spanning the lobbies, convention spaces and streets of five hotels, there is literally something for everyone at Dragon*Con. Once again this year, I have been privileged to be invited to sit on a panel to discuss Harry Potter. “Father Knows Best: Dads in Harry Potter” will discuss the fathers/father figures in the Harry Potter series. The panel will be held on Sunday, September 1 in the Atlanta Marriott, Room A707. For those of you who’ve followed my blogs for the past few years and who share my interests, some of the notable guests for this year include Natalia Tena (Harry Potter, Game of Thrones), Kelly Hu (The Vampire Diaries, The Scorpion King, X-Men 2), Richard Dean Anderson, Christopher Judge and Teryl Rothery (Stargate SG-1), Kristin Bauer, Jim Parrack, Janina Gavankar, Lauren Bowles, Rutina Wesley, and Tara Buck (True Blood), and Keegan Connor Tracy and Raphael Sbarge (Once Upon a Time). There is also a large contingent of guests from Star Trek’s Deep Space Nine and The Next Generation, Buffy the Vampire Slayer, Smallville, The Walking Dead, and so on. This year will be a bit different for me, as I will be “working” during most of the convention, but I will definitely do my best to get out and about and find interesting stuff to blog about. For those of you who are interested in attending, membership information can be found at this link. Hope to see you there! !